Black polypropylene mini trigger sprayers were built with convenience in mind. It takes far less effort to operate these mini trigger sprayers than a typical finger sprayer. In addition to that, its valve engine can handle products with a higher viscosity, such as lotions and gels. It has an output of 0.2 cc (210MCL) and is offered with dip tube lengths ranging from 5" to 7 3/4". 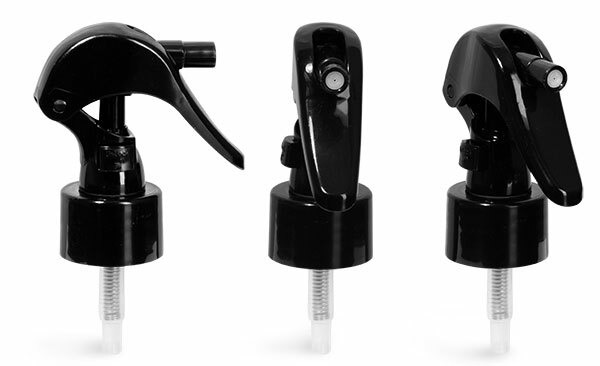 Each mini trigger sprayer has a button along the neck which locks and unlocks the trigger lever, preventing any product from dispensing during shipment. Click the Add-Ons button to view compatible containers.